The best quick and easy peach dump cake recipe (peach cobbler dump cake), homemade with simple ingredients. A great Summer dessert, made with 3 ingredients and starts off with a yellow cake mix! This is one of the easiest desserts you can make, especially when you are short on time. You just dump everything in a cake pan and just bake. I am not sure why they refer to it as a cake because but I really feel it has the texture of a cobbler more than a cake. 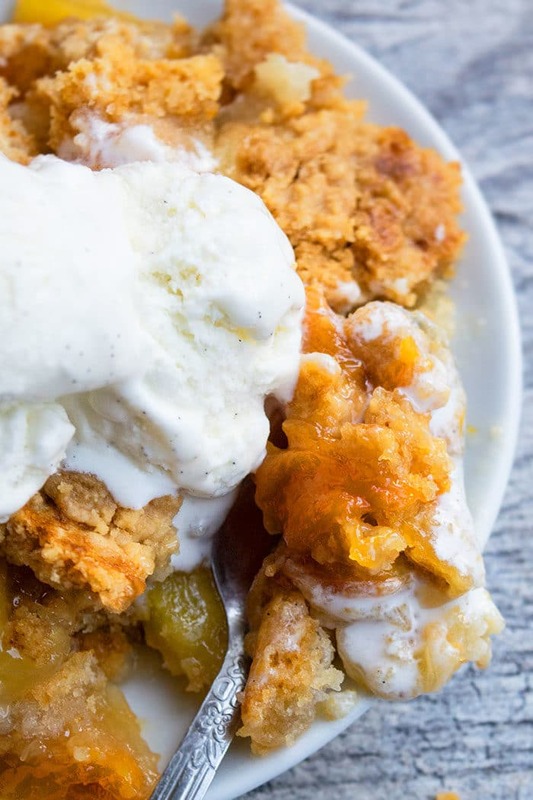 Once everything is baked, you end up with a soft yet crumbly cake-like cobbler topping and ooey gooey, juicy, warm peaches underneath. Serve it warm with vanilla ice cream and it’s truly incredible! If you are fond of peaches, you should really try out this Peach Pie Filling or this No Bake Peach Cheesecake and this Peaches and Cream Dip. 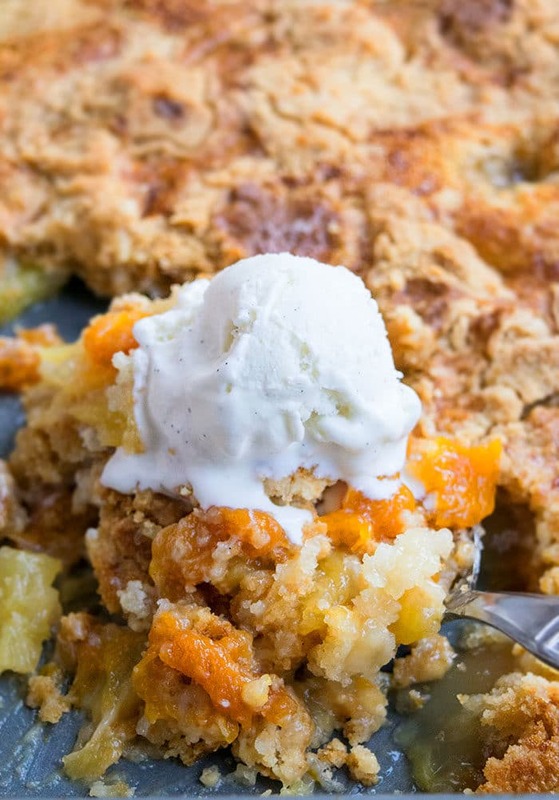 This doctored cake mix recipe beats fresh peach dump cake recipes from scratch! I have tried making this without a cake mix and it just did not taste as good. Maybe I just grew up eating this version since that’s the way my family makes it and I am just used to it. It never disappoints! Add spices- Cinnamon and nutmeg are a great addition. Add nuts- Sprinkle some chopped pecans or walnuts on top, prior to baking. It adds a little crunch. Peach Cherry dump cake- Omit the can of pineapples and add 1 can of cherry pie filling and 1 can of peach pie filling. Peach Blueberry dump cake- Omit the can of pineapples and add 1 can of blueberry pie filling and 1 can of peach pie filling. Use only peaches- I like to use a combination of peaches and pineapples because they taste so well together but you can omit the pineapples and use 2 cans of peach pie filling or 2 cans of canned sliced peaches in heavy syrup (14.5 oz. each, Don’t drain!). This is the classic 3 ingredient version (cake mix, peaches, butter). 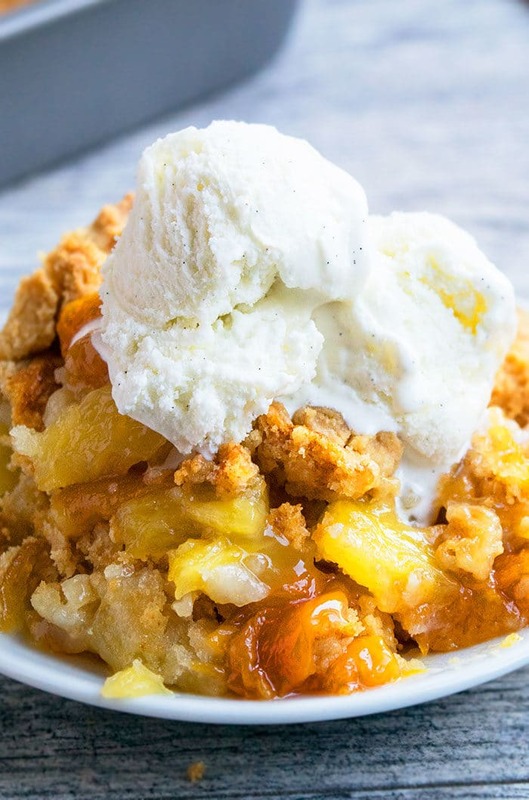 How to make crockpot peach dump cake? The instructions for slow cooker are different than the baked method. Spray oil inside a crockpot. Pour peach pie filling and pineapples. In a mixing bowl, mix together melted butter and cake mix until crumbly. Spread this over the fruits. Cover and cook on High for 2 hours or Low for 4 hours. Serve with ice cream and enjoy. Fresh or frozen peaches vs. Canned peaches- Canned fruit is my personal preference because it’s much more quicker and convenient. If you use fresh or frozen fruit, that’s an entirely different recipe. Quick and easy peach dump cake recipe (peach cobbler dump cake), homemade with simple ingredients. A great Summer dessert, made with 3 ingredients! 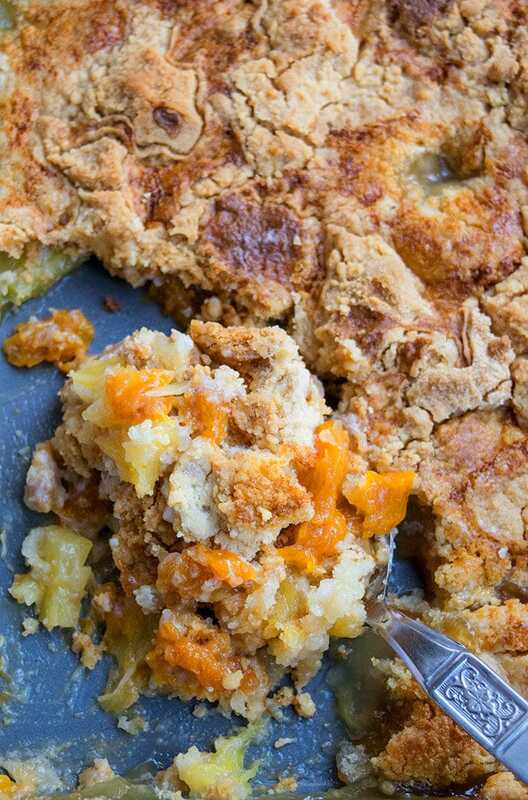 Dump peach pie filling and pineapples in a rectangle cake pan (Dimensions: 9×13). Cut butter into small pieces and place them on top of cake mix. Bake at 350 degrees for 45 -55 minutes until the top is golden brown and firm. Could you make this with home-canned peaches in very light syrup? I really don’t see any reason why it won’t work. Let me know how it goes.